It took me some time to begin writing on this blog after it was created good time ago. And it took me even more time to decide on the first recipe. I was thinking to myself; maybe I should start with the most classical Palestinian dish like Msakhan and Maqloubeh, or with a worldwide known one like Hummus and Falafel, or maybe with one of the basic everyday Palestinian food like Pickled Olives and Zatar (Thyme). Then I told myself, “Eman, simply start with your favorite dish!”. And here we go with Cauliflower in Tahini Sauce. 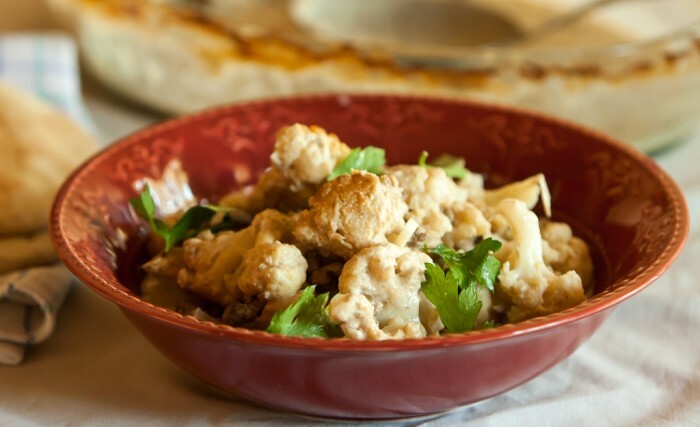 Cauliflower with Tahini Sauce is popular particularly in Palestine and generally in Levant. It’s a perfect winter dish made of healthy and tasty ingredients. One is Tahini, which is made of ground sesame seeds and is essential in East Mediterranean cooking. 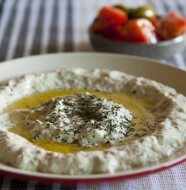 Adding rich flavor and texture to food, Tahini also provides good fatty acids, minerals and energy. 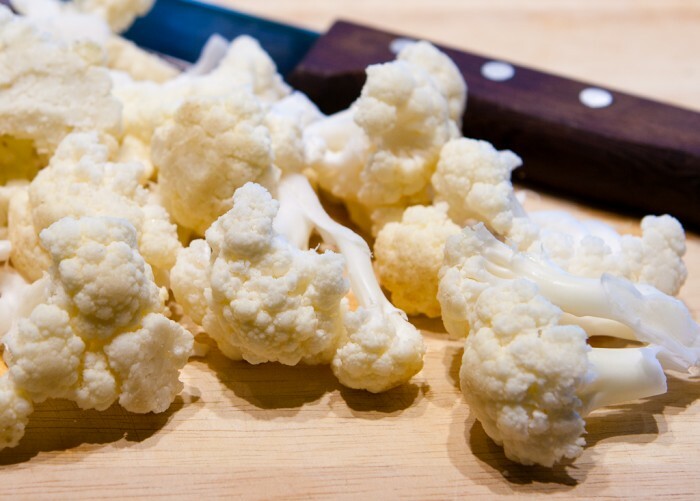 Another ingredient is cauliflower, a cold season vegetable, usually produced in December and January. It is considered a rich source of Vitamin C and fibers. So it makes all the sense for these two ingredients to come together in one wintery dish. In this recipe I use pan/shallow frying to cook cauliflower florets instead of deep frying for less oil intake. However roasting the florets would be the healthiest option. Also it’s good to mention here that this dish can be a vegetarian choice if you eliminate the beef from it. 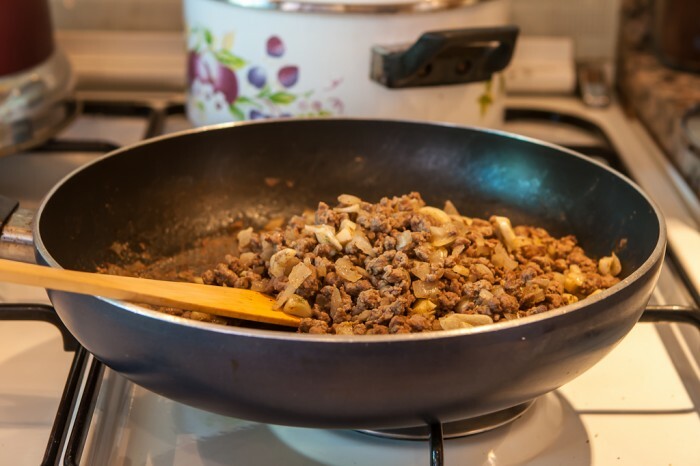 Heat 1 tablespoon of oil in a saucepan, add minced beef and simmer over medium heat for 3 minutes, or until semi-cooked. Add chopped onions, garlic, 1 teaspoon of salt, black pepper, and 1 teaspoon of cumin. Stir into the mix, and then simmer for another 3 minutes on a reduced heat until onions are tender and beef is cooked. 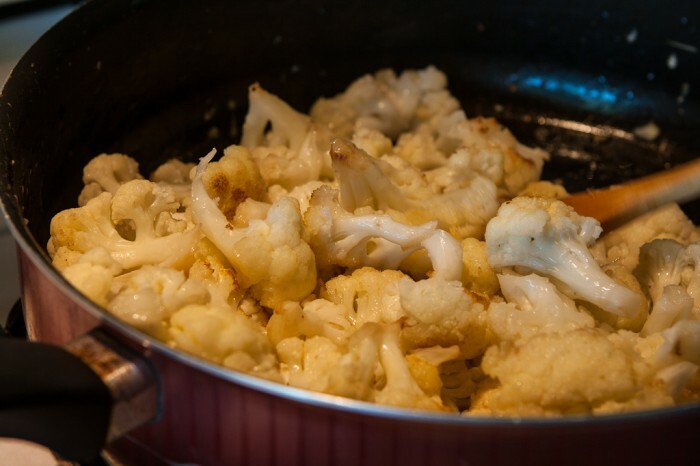 In a different deep and large saucepan, bring 5 tablespoons of oil to heat, add the cauliflower florets and cover the pan. Leave the florets to cook over low heat for about 15 minutes or until they become golden. Turn them to cook on the other side for another 15 minutes or until florets are cooked and golden from both sides. Add another teaspoon of cumin and some salt to the cooked florets. On a blender, add tahini paste, lemon juice, yogurt, 1 teaspoon of salt, and 5 cups of water and blend together at a medium speed until it’s well blended and smooth. *I prefer to use a blender but mixing the paste with other ingredients using a whisk does the job too. 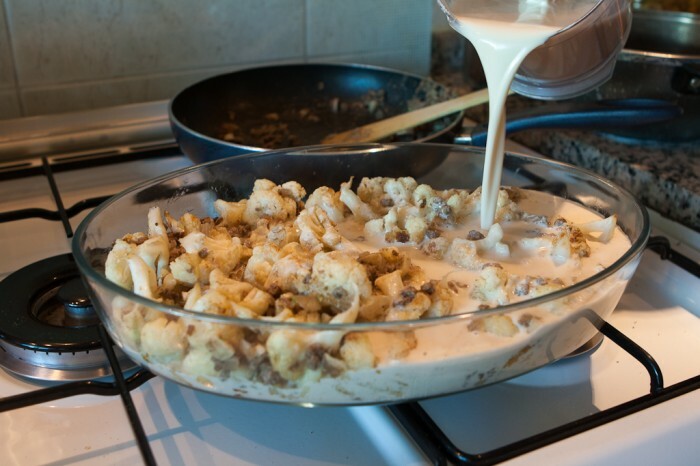 In a medium size ovenproof dish, add cooked florets, beef mixture, and tahini sauce. Place in oven at 180 degrees for 60 minutes or until sauce is mostly absorbed. 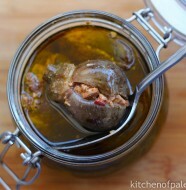 Serve hot with taboun or pita bread. Garnish with parsley. 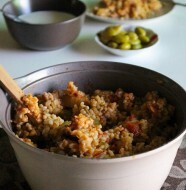 12 Comments on "Cauliflower with Tahini (Zahra Bi Tahineh)"
have not had this dish in years, but have few questions questions before making it..,,is it more common with meat or vegetarian? and do people traditionally use ground meat or lamb chunks? also please explain the procedure when making without meat ..would I still saute the onion and garlic and cumin?and finally do you cover the dish in the oven?im kinda new in the kitchen so please help! thank you in advance and Ramadan Kareem! It’s commonly cooked with ground beef. I thought that it would make a good option for vegetarian people by dropping the meat. In case you insist to cook it without meat, yes you have to saute onion and garlic and use half quantity of spices (I think I have to update the post accordingly). thank you again. Definitely will be making it with the ground beef then!! !…will let you know..the only problem here in Florida its hard to get fresh, soft pliable chemical free tasting pita/khobiz..it makes all the difference when serving a dish like this..
hi.. just cam across your great blog..I had this dish many years ago at a Palestinian friends house and really want to try it out myself….when making this will the sauce be very runny as it calls for 5 cups of water? is that U.S. cups? Yes 5 US cups. The sauce is very runny before cooking (see the last photo) but when cooking it for about 60 to 70 minutes in the oven without covering the dish, most of the sauce is going to be absorbed. I’m happy to hear this.. Thank you so much Doaa.. I had this dish a few years ago, but it was called a different name. Wanting to make it, I tried searching for it by that name and could never find it. I’m so glad I stumbled across your recipe! Will definitely be making this soon! Great blog – hope to visit more often! Hi, I just made this dish and it is delicious! Thank you for posting such great easy to use instructions! I just have a quick question, the 180 degrees, is that in Celsius or fehrenheit? Thank you! Thank you Ronza, I’m happy to hear that. 180 Celsius degrees, I should add this piece of information.